The first part, Using an Empowerment Model to Prevent Elder Abuse and Assist Victims, highlights the important and unique elder abuse work being done by this organization and program. 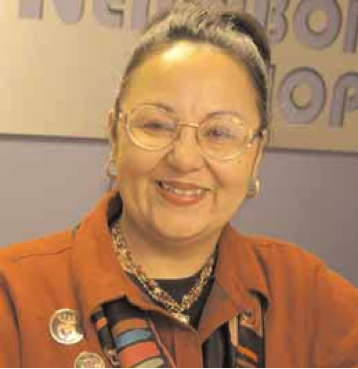 I had the honor of speaking with the illustrious Dr. Laureano about about Neighborhood SHOPP and the VIP Program and, during our conversation, I asked her about her visions for the future of the elder justice field and she gladly offered her helpful insights. Her words, as she shared them with me, are outlined below. Secure a baselined funding stream for elder abuse services in New York City. Every year, elder justice advocates fight for New York City Council to restore $800,000 of discretionary funding, which funds elder abuse services through the NYC Department for the Aging. Professionals can continue this fight by raising awareness of elder abuse to public officials and joining other elder justice professionals in advocating for a dedicated funding stream for elder abuse services in New York City. Recruit more professionals to the fields of aging and elder abuse. As more professionals join the aging and elder abuse fields, there are more trained professionals who understand the complex issues that older adults face, especially those who experience abuse. As professionals already in the aging field, we must get the word out and encourage others to join us in furthering this important work. Increase educational opportunities for elder justice professionals and healthcare providers. We have so many wonderful tools that can be used to train elder justice professionals and other health care providers; however, there is still a lack of awareness of elder abuse. The annual NYC Elder Abuse Conference attracts many elder justice professionals, provides excellent sessions and resources and we need to foster more of these types of learning opportunities. In addition, we need to raise awareness of elder abuse issues among health care, psychiatric, medical and emergency room professionals. Similar to child abuse training, which is mandated for professionals entering into certain fields, elder abuse training should be required for health care professionals and the training should be ongoing. Elder abuse trainings must be mandatory for all medical providers who are dealing with older adults on the front line. This is important because these professionals need skills for screening for elder abuse. For example, when a clinician meets with a client who has bruises, the clinician should ask questions to gather information about the situation. Too often there is no exploration or assessment done. The great news is that there are elder abuse training tools already available and we need to advocate for an increased number of trainings across disciplines and service systems. Currently in NYC, geriatric fellows receive elder abuse training, so we need to think about ways to replicate this training for the larger population of providers. Challenge ourselves to have curious minds and ask questions about our clients’ cultural backgrounds. There are also tools already available to help us practice cultural competency when working with clients. It is crucial that we are aware of differences in populations. One cannot make assumptions about a particular cultural group and generalize those assumptions to everyone. Thus it is critical that we, as elder justice professionals, are comfortable asking respectful questions. By doing so, we will open up rich conversations with our clients, which will make the helping relationship so much more meaningful. Engage more with the faith-based community. This is especially important because we know that Latinos and African Americans regularly attend church. Elder justice professionals can partner with faith leaders and expand elder abuse awareness with these professionals as well.